Earlier in the month, Samsung began soak testing its Android 6.0.1 Marshmallow update for its Galaxy S6 series in Europe, which followed earlier reports of a preliminary software release in South Korea. Today, Samsung has officially announced the Android 6.0.1 Marshmallow update for its Galaxy S6 edge and edge+ handsets in South Korea and has detailed the key new features and improvements. As well as the general Android improvements, the major software changes are focused around the handsets’ unique edge apps. First up, the pixel panel size has been increased from 260 to 550 pixels, allowing for additional content to be displayed and new features implemented. The people edge app has been changed up a little too. Additional contact names have been added in below the picture and there’s a shortcut to the settings menu thrown in as well. A similar change has been made to the Apps edge feature, users can now add up to 10 apps, rather than just 5, and entire folders to the menu. 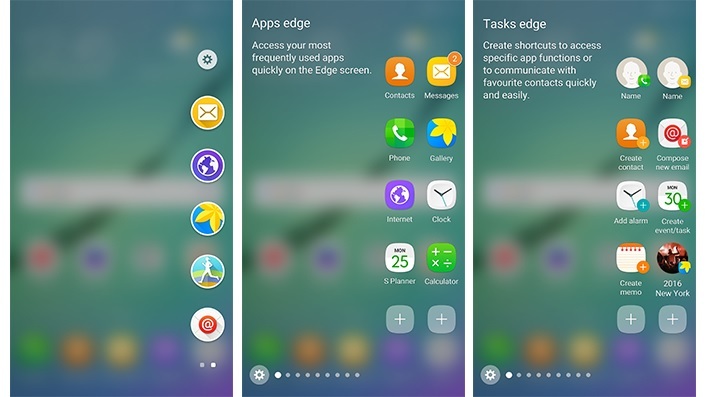 Samsung has also introduced a new Tasks edge panel with its Marshmallow update, which allows users to quickly start up common tasks, such as setting an alarm or composing a text message, with just a single tap. This can also be used to access tools such as the compass or flash light. The Marshmallow update begins rolling out to S6 edge and edge+ handsets in South Korea from today, February 15th. Samsung says that Android 6.0 Marshmallow updates for other Galaxy devices will be following shortly. The company also states that other regions will be receiving separate announcements regarding the OS update and that carrier branded handsets will be working on their own timetables, as usual.